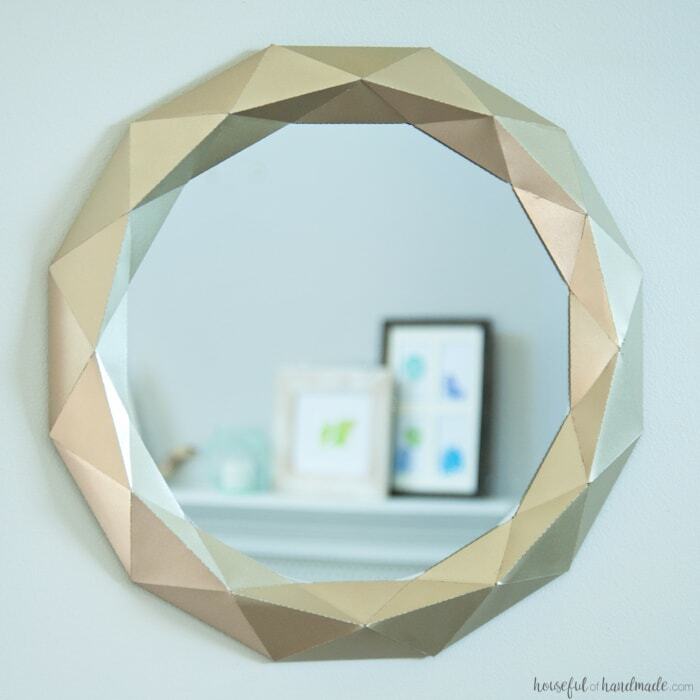 Make a beautiful Anthropologie knock off mirror for less than $10! 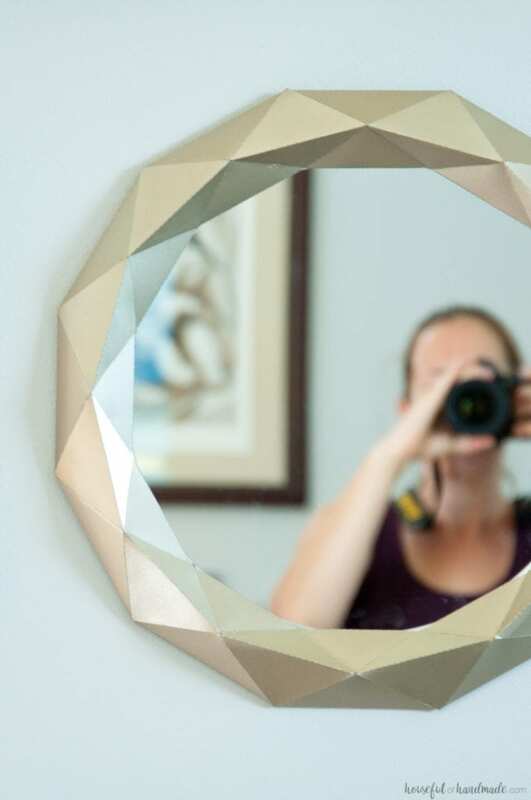 I am so excited to share this mirror tutorial with you today! I have been oogling over this Anthropologie mirror for a while now. It’s just so different, yet simple; rustic, yet pretty. And I am a big fan of gold accents right now. But the $168 price tag for the small mirror just isn’t in my budget (I can think of so many other things I could buy for $168). So when I find something amazing that is not in my budget, I DIY it! It took me a couple tries to get this one right, but I was persistent. Now I am so excited to share my easy $10 Anthropologie mirror knock off tutorial with you! When I first saw this Anthropologie mirror, I never thought about DIYing it. There are so many weird angles and I have a love/hate relationship with geometry. I love what it can do, but I hate doing it! But sometimes I just get really excited about a project that I am determined to see it through, and that is what happened with this budget mirror knock off. Of course when you think about DIYing a mirror, you think of using the normal material: wood. And I really thought hard about it, but those angles. There are so many little pieces cut at all kinds of not 45 degree angles that I knew I would loose a finger trying to do that on my miter saw. So I had this crazy idea to make the frame to the mirror out of… PAPER! Yes, you read that right. 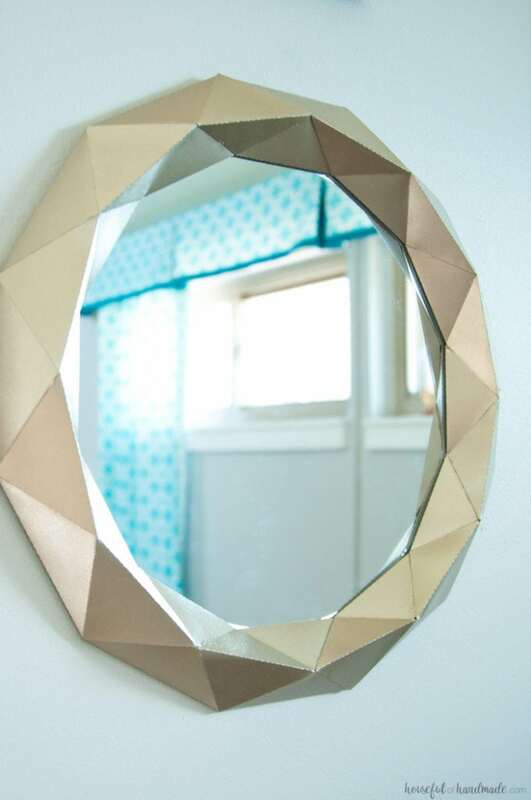 The frame to this Anthropologie mirror knock off is made completely out of paper (and I guess a little tape and hot glue to hold it all together). 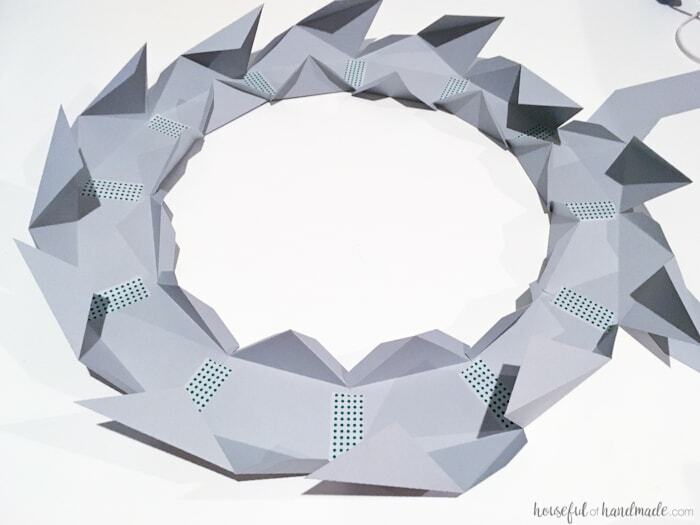 I have used paper for a lot of different decor ideas, but now that I know it can look like this, I will definitely be using it to stretch my decor dollar even more. To make this mirror, it cost me less than $10. I used 4 pieces of 8 1/2 x 11 inch cardstock (any color will do but I recommend using a color that is close to the final color you will paint it so it is easier to cover), half a can of spray paint (I used Rustoleum Metallic Paint & Primer In One in Champagne Mist), a 12″ circle mirror, and a little hot glue and tape. I used a 40% off coupon at Hobby Lobby to get my mirror for $3.59 so my total was less than $10! Compare that to the $168 price tag for the 2″ larger mirror at Anthropologie and I’d say I came out a winner. Now I did say that I had to make the mirror twice. The first time my seams were a bit bulky so they didn’t come together to make the beautifully seamless angles. And I messed up on my measurements so it was slightly bigger than my 12″ mirror. But even if you add in the cost of the first 8 sheets of cardstock, and I did use the first half of the can of spray paint on the first one but had plenty for the second attempt, I still saved over 90% off with my knock off. Are you convinced? 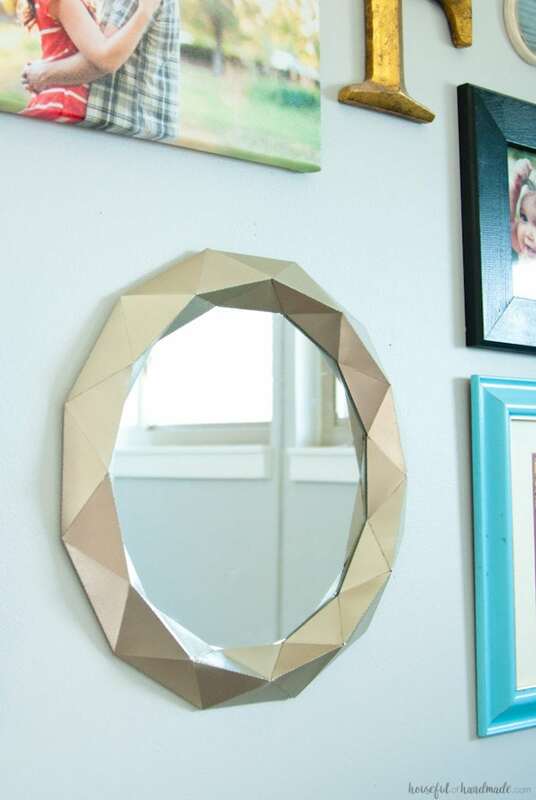 A paper mirror frame is crazy right? I think it looks like a million bucks, just look at how awesome it looks in our gallery wall in the living room. So if you are ready to make your own super cheap Anthropologie knock off, get ready cause I am going to share the tutorial! To start you need to cut out 12 of these crazy little pieces. I toiled and strained my brain, but I figured out the angles needed to make the mirror work (and lucky you, I am sharing the PDF and Silhouette cut file in my library of freebies, sign up at the bottom of the post or in the sidebar to my weekly newsletter and you will get access to the library of freebies today). I cut them out with my Silhouette and I was able to fit 3 pieces on each 8 1/2 x 11 sheet of cardstock. After they were all cut out, I needed to fold them all. 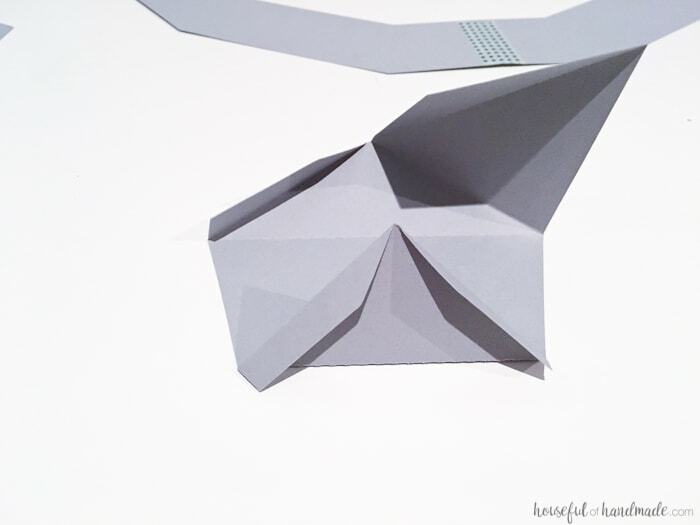 There are subtle dotted lines to fold along, but I made them very small so the paper wouldn’t get too weak from all the extra cuts. All the fold need to be folded toward the ceiling, except the two flaps on the small triangle on the bottom. 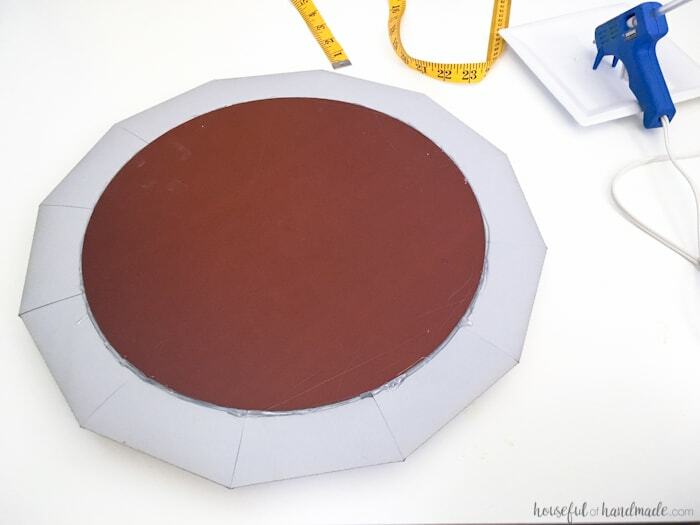 Now it is time to create your dodecagon (that is what you call a 12 sided polygon in case you were wondering, yeah I had to Google that one). 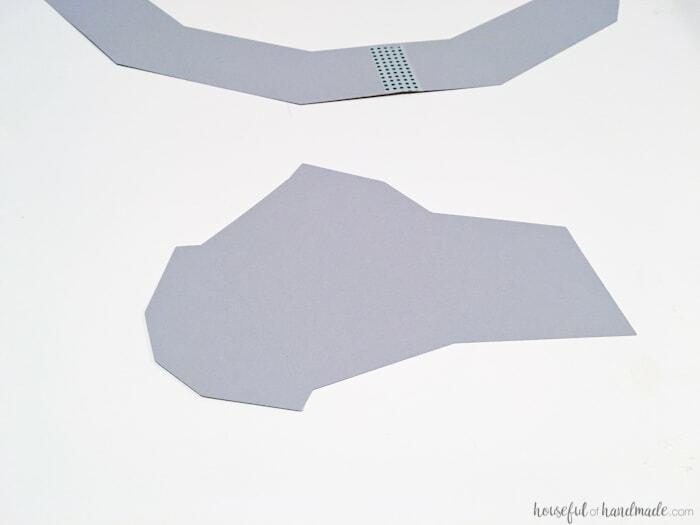 Inside each piece you cut and folded is a trapezoid (yeah I had to Google that one too, but it has been a very long time since I took a geometry class). You will need to line up the trapezoids so that the small sides are all facing into the center and the large sides are all facing out. I used a small piece of tape to attache the trapezoids to each other. 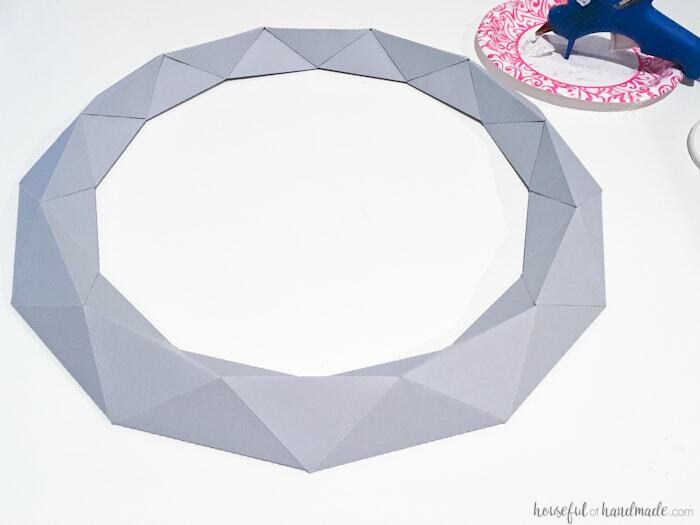 Once you get all the way around you can tweak any parts that are not laying correctly so you have a perfect little dodecagon with all kinds of crazy folded sections attached. Now it’s time to get the hot glue gun ready. You will start by attaching all the outside triangles to each other. 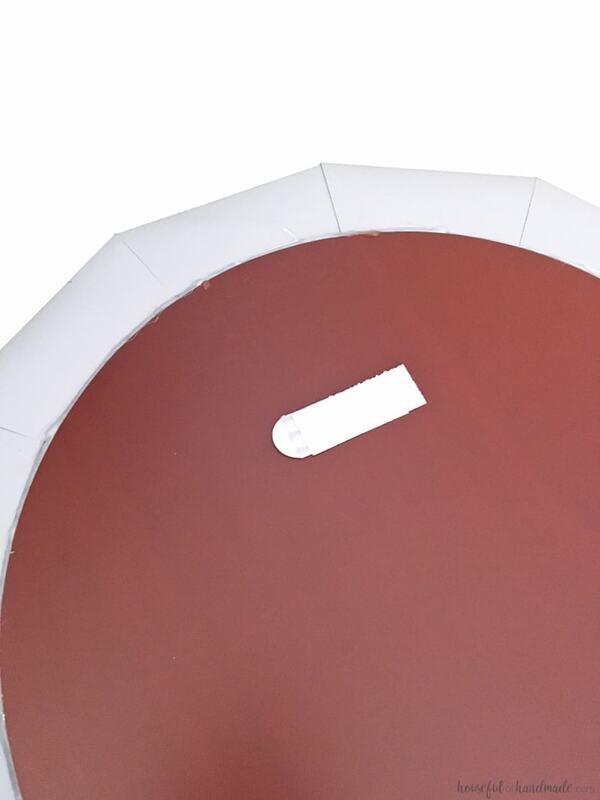 The triangle that is attached to the outside of the trapezoid will need to be glued down to the triangle section that folds over the peak of the mirror frame. There are flaps that you can add your glue to then secure these. Be careful not to get hot glue on the outside of the mirror frame. The metallic spray paint does not hide globs of hot glue, instead it accentuates it (I know this from personal experience, the first frame attempt was covered in less than perfect areas I was hoping would be hidden by the paint but I was dead wrong). Once you have gone around the entire dodecagon and closed up the outside of the frame, you will need to do the inside. This can get a little tricky because it is a tight space you are working with. Only work on one flap at a time so you can insert your fingers inside to pinch the pieces tight together while the hot glue dries. Then the mirror will be all done. 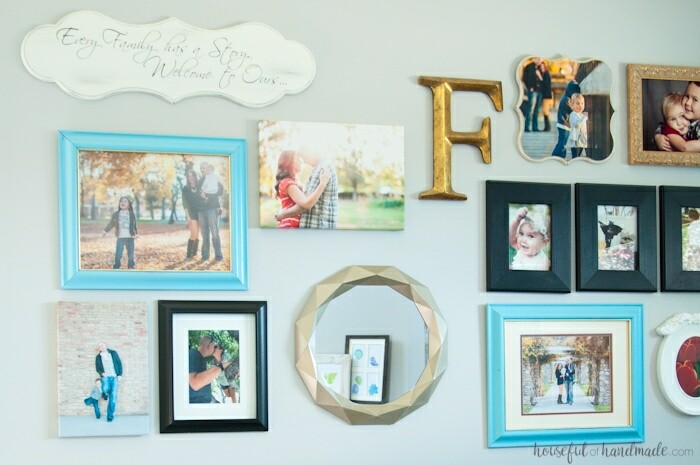 It really only takes about an hour of cutting, folding, and glueing to get a completed frame. Now it’s time to paint. 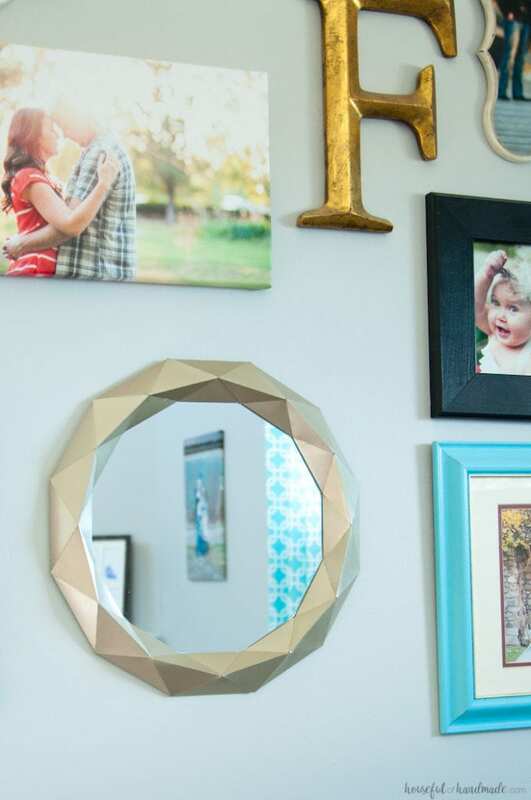 Take your beautiful new mirror frame outside and give it a lot of coats of the metallic spray paint. I didn’t really keep count of how many coats I gave it, but it was at least 10. I used lots of light coats to get a smooth, golden finish. The metallic paint needs a heavier coat to really glisten like metal, but thick coats will clump and drip so take it slow. Luckily, a thin coat of spray paint dries in about 2 minutes so you can get 10 coats on pretty quickly. 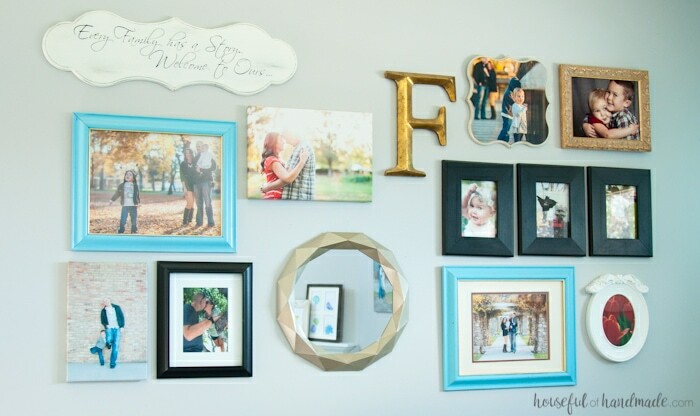 After the paint is dry, you want to center the mirror behind the frame and secure it with more hot glue. I am not too worried about the frame coming loose because it has very little weight to it (it is made of paper). And the mirror is hung from the mirror, not the frame, so hot glue is perfectly fine for securing the frame to the mirror. To hang my mirror I used Command Picture Hanging Strips. I have used these with heavier frames with glass and pictures in them and have never had any fall so I knew it would make quick work of hanging my lightweight mirror. What do you think? Can I pass a paper mirror frame off as an Anthropologie mirror? I sure do love the way it looks and for less than $10, I think I need to make a few more. The best part, I can paint them to match whatever decor I want them to go with. Maybe I’ll make a bright pink one for my daughter’s room or a deep plum one to add another pop of plum to our master bedroom where I have a few plum accents already. I think the pattern would even work if you scaled it up or down. 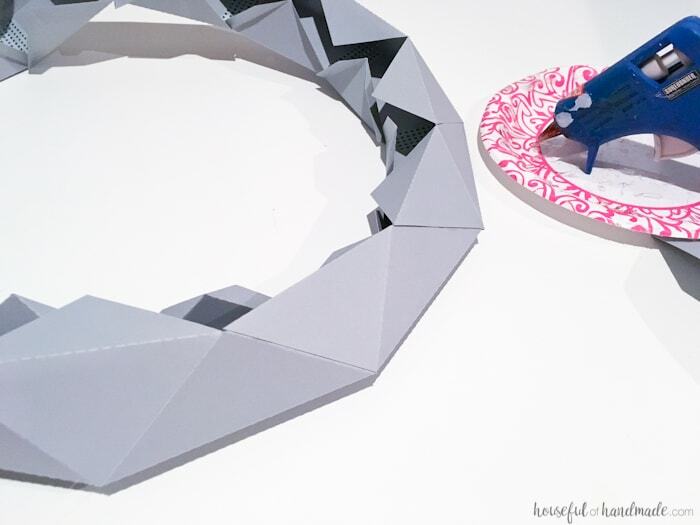 As long as all the pieces are scaled the same, they should still link together to make the perfect dodecagon mirror (that may be my new favorite word). 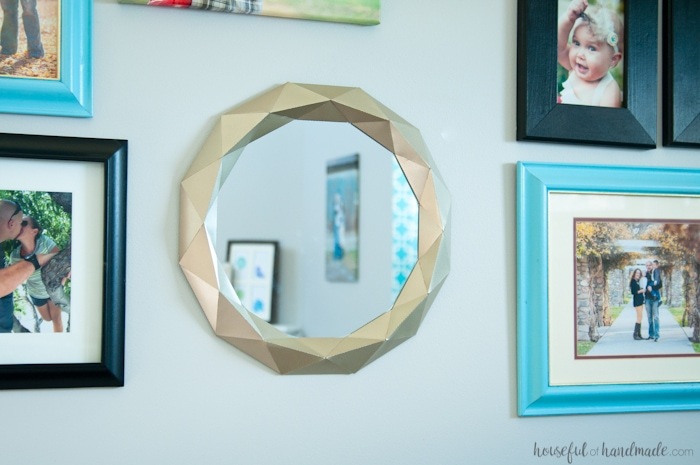 And can you believe, this is the very first decorative mirror I have added to our house!?! I am sad to admit that I have had the best of intentions to add mirrors around our home, but haven’t done it until today (story of my life). Now I am so excited for the way the mirrors look, that I am already planning mirror #2 to make an entrance this month… maybe on the coastal mantle I have been working on. So if you are ready to make your own easy $10 Anthropologie mirror knock off, you can download the free Silhouette cut file or PDF of the pieces in my library of free downloads & printables. I share lots of my favorite printables and downloads with my email subscribers, so subscribe today for access to this file and many more. And I will leave you with my latest selfie. I was having a hard time getting a straight on shot of my new mirror because all you can see is my reflection. But the mirror looks really great, and you can get a glimpse of our life this summer: me with no make-up, a pony tail, and a simple tank top! I had seen this post but only today did I take the time to go through it and see how it is actually done. Amazing. I am wondering though how big we can go. But as a start I’m thinking of using this idea for a spring wreath to which I’ll add some flowers….if I actually end up doing this I’ll send you a pic. Thanks a lot for sharing all this. This would be so fun for a wreath! You can go as big as you can get, just make sure the pieces are all sized the same percent width and height so it doesn’t mess up the angles. I have gone smaller for some decor in my office. I say go big and have fun! This is such an incredible DIY!! I had to choose it for my Feature Pick for this week’s Merry Monday party 🙂 Thanks for linking up with us! 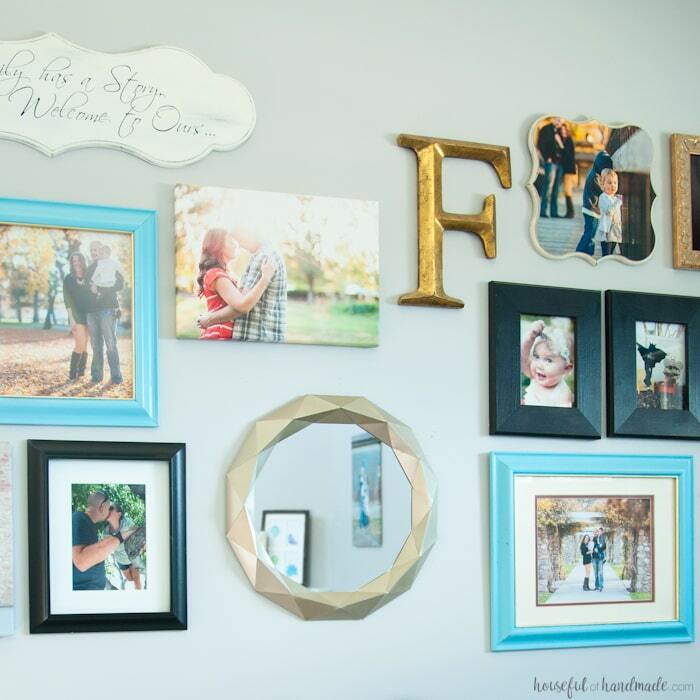 This is gorgeous — What a great DIY! Thanks for sharing at Merry Monday! What?! I can’t believe thats paper, it is stunning! Pinning and I definitely want to try this. Thanks Rachel! It’s so easy and fun. I love showing it off when friends come over cause they can’t tell it’s paper. How on earth, what the, how did…I wish I was 1/2 as clever!! This is the most amazing thing! Thanks Angie! You are too kind. Very creative! I just love it! Oh my gosh you crazy genius you! How in the world did you figure out the shape you needed? I would have been sitting there trying to cut out each little triangle and probably would have pulled all my hair out and gave up lol. So cool that you made this from paper!!! Thanks Amanda! You are making me blush 🙂 I did have to tweak it and make a second mirror, but luckily the stars were aligned just right so it worked out somehow. This is amazing! How in the world you figured out how to do this, I don’t know, but it is absolutely gorgeous. Oh. My. Gosh. You’re a friggin genius! It looks so good and figuring out those angles- impressive! Thanks Meredith! I always want a little glam in my life 🙂 I hope you try it out, it’s so easy. Wow I can’t believe you made that out of paper! What and amazing mirror! Thank you for linking up with Dream. Create. Inspire. Link! Pinning and sharing! Thank you Cat! I am starting to really love paper as a DIY medium, so inexpensive and so easy to manipulate. It’s perfect. Elaborate origami and mathematical shape and gold and mirror – it has a lot of the qualities I love. 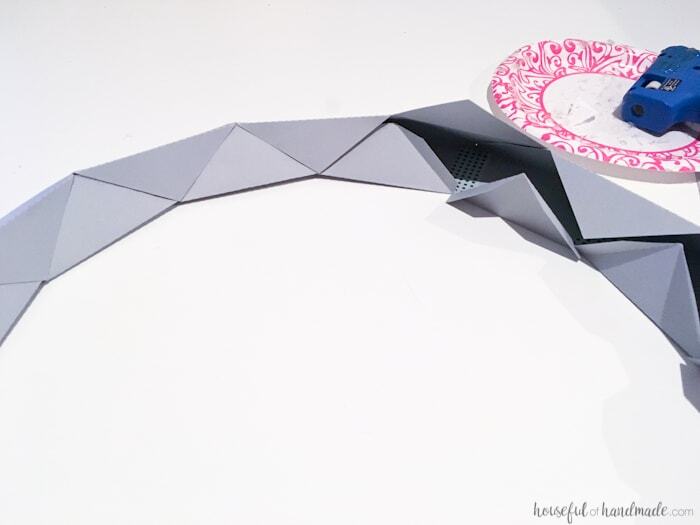 It is kind of an elaborate origami but less folding and more cutting. And the gold is definitely my favorite. Thanks for sharing! I am so impressed! That looks amazing and I am with you on the gold accent obsession right now. Great job! Thats a rather amazing feat you have pulled off here! I am duly impressed. Wow, what a great knock-off! I never would’ve known that was made from paper. Brilliant, just brilliant. You can only tell it’s made of paper once you’ve said, I would never had guessed! Oh my! This is stunning. And it looks like it cost much more than it did. Definitely a project I would love to do. Pinning! Thanks Jelica! The price tag of the knock off is so much better than the original. You definitely need to make one! This looks amazing! Much better price tag than the original, and you’d never be able to guess it’s made from card stock! What a creative knock off! Thanks Celeste! I am so happy with it and it makes me smile every time I look at it knowing it’s made out of paper 🙂 Saved me a ton of money!